Perhaps as a child you worshiped Indiana Jones, bought yourself a fedora, and hoped to search for supernatural treasures long lost to mankind. Mythology has been rife with mysterious objects of power that imbue the user with unique abilities. So, fedora in hand, let’s venture into the world of mysterious and fantastic powers. Most people are familiar with the concept of the Philosopher’s Stone, but few have heard of the Cintamani Stone. Said to be lost somewhere in Southeast Asia, the stone is the Oriental equivalent of the Philosopher’s Stone. The stone is thought to be a relic of Buddha, and is able to grant wishes. Supernatural powers aside, the stone represents Buddhist values and teachings. It has never been found (of course), and there has never been any solid evidence of its existence. The Seven-League Boots are a recurring artifact in numerous European fairy tales, and the boots themselves allowed one to travel seven leagues (roughly five kilometers or three miles) per step. The boots aren’t very well known, and they are featured primarily in the French fairytale Hop-o’-My-Thumb. In the story, Hop-o’-My-Thumb is a small boy who is extremely intelligent. When his parents abandon him and his brothers, he becomes the (very tiny) man of the house. When an ogre decides to make a meal of the brothers, Hop-o’-My-Thumb steals their magical boots to escape and make his fortune for his family. Plenty of us have seen the Lord of the Rings movies and are familiar with the One Ring, the cursed ring that grants invisibility but eventually corrupts the souls of those who wear it. Luckily, mythology has a ring that grants invisibility without the nasty side effects. The Ring of Gyges was a ring from a story told by the famous philosopher Plato. In the story, Gyges is a shepherd who finds the ring after an earthquake reveals a cave near where he herds his flock. Upon entering the cave, Gyges finds the ring on the finger of a corpse that doesn’t seem human. When he places it upon his finger, he discovers he can become invisible by adjusting it. Gyges then goes to the palace of his local kingdom, woos the wife of the king, then kills him and becomes King of Lydia. So . . . maybe we were wrong about the soul-blackening part. This is an item you better hope a burglar never gets his hands on. The Hand of Glory was fashioned from a condemned murderer’s hands. A wax candle was affixed to one of the fingers, and the dead man’s hair was used as a wick. It had the power to unlock doors and freeze people in place. Its flame could only be extinguished by the thief who wielded it, and it would have been a vital tool to the criminal trade if it ever existed. In its day, the Hand of Glory was considered to be the product of extremely black magic. Let’s say you’re out for a picnic, and you’ve forgotten the food. That’s not an issue, you just need to whip out your Skatert-Samobranka. The Skatert-Samobranka was a magic tablecloth that could produce food when unfurled and cleaned itself up when it was folded again. As with most supernatural items, there were rules. The Skatert-Samobranka was sentient, so it needed to be respected and cared for. If angered, it might have ruined the food, and any rips or holes would cause it to slowly lose its magical properties. That’s one temperamental tablecloth. The Book of Thoth was a book of ancient magic used by the Egyptian god of wisdom and magic, Thoth. The Book of Thoth was said to contain two spells—one to understand animals and one to understand the mind of the gods. In an ancient Egyptian story, a prince of Egypt found the book after avoiding a series of traps. As punishment for finding the book, the prince’s family was killed, and the prince committed suicide. Years later, a new prince found the book but was warned by the old prince’s ghost not to take it. He didn’t listen and was promptly convinced by a beautiful woman to humiliate himself and kill his children. However, he discovered that the whole thing was an illusion created by the old prince’s ghost as a warning. He placed the book back into the old prince’s tomb and left. Another Greek legend, the Helmet of Invisibility was a helmet once owned by the hero Perseus that could grant—you guessed it—invisibility. Perseus wore the helmet in his quest to slay Medusa. It prevented her petrifying gaze from affecting him when he went into battle. Perseus returned with Medusa’s head, so his quest went quite well. The Spear of Destiny is a sacred relic in the Christian faith. It is said that the spear that pierced Christ’s side was imbued with unique powers. Supposedly, only the owner of the Spear of Destiny could control the world. Many a conspiracy nut will tell you that Hitler, while dabbling in the occult, took the spear for himself and went on to conquer most of Europe. Later, when General Patton arrived in Nuremburg, he took the spear from the city, and Hitler’s reign of terror soon ended. 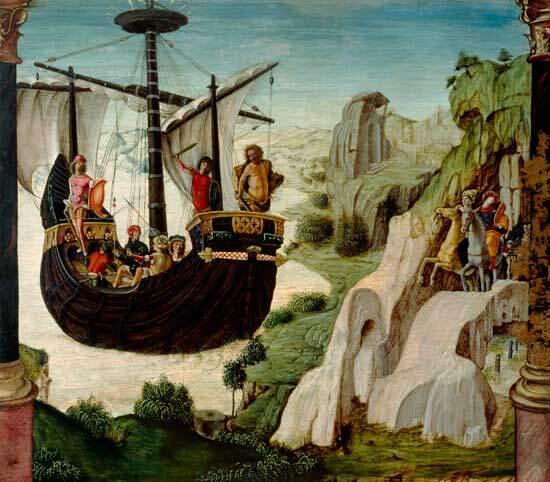 Anyone familiar with classical mythology is probably familiar with The Argonautica by Apollonius of Rhodes, the tale of Jason and his team of heroes (the Argonauts), who quested to gain the Golden Fleece in Colchis—so that Jason could claim his throne. The ship itself was said to be under the protection of the goddess Hera and was made from the timber of the forests of Dodona, which held the power of prophecy. When the quest for the Golden Fleece was done, the Argo was placed into the heavens as a constellation. Dragons are the quintessential monster of European folklore: giant, fire-breathing lizards that may have been the medieval explanation for dinosaur bones. The Greek legend of Cadmus states that, in the days of yore, Cadmus killed the sacred dragon of the god of war—Ares. Athena, Ares’s sister, told Cadmus to plant the teeth, which grew into a fresh crop of soldiers. He then threw a precious gem in amid the soldiers, who fought each other for it until there were five survivors. These five later went on to found the city of Thebes. To this day, to “sow dragon’s teeth” means to cause something that breeds dispute. Vlad Vekshtein is an eccentric writer and mythology buff desperately trying to churn out his first novel. He’s quite sure the closest he’ll ever get to a mythological artifact is Monty Python and the Holy Grail. He’s always on the lookout for new list ideas, so sound off in the comments!